Policemen in India have caught up with 10 alleged Nigerian scammers using fake fund transfer to dupe people. 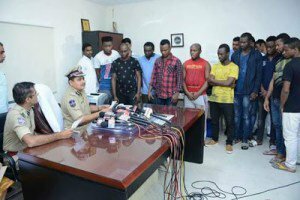 The Cyber Cell of Rachkonda Police on Monday, arrested 10 Nigerian nationals from New Delhi on charges of fake fund transfer. The gang, between the age group of 23-37 are Willams Akpobaroeh, Isic Prince Okonedo, Chukwuma Christopher, Eghosa Gobieit, Ijeoma Onyesom, Emmanuel Okafor, Chima Iweriebor, Tochukwu S/o Onwubiko Christian, Chidi Johnson Anaso Johnson, Paul Ifechukwu IfanyiIfanyi. They cheated several persons from different parts of the country in the past. Police officers also recovered eight laptops, twenty-six mobile phones, one iPad, and thirty five sim cards from the fraudsters. According to the police, a 36-year-old victim, who works as a Nurse in a corporate hospital in Secunderabad, accepted a friend request from one Agustin William, who introduced himself as a Pastor working in Northern Ireland. After chatting for three months, the accused promised to send the victim gifts worth $50,000 along with I-phone, wrist watch and a gold set with pearls. On March 15, the victim received a call from a man claiming to be a custom official working at Delhi Airport. He asked the victim to deposit Rs 27,500 as registration fee to claim the courier and then continued to persuade her to spend money citing various other After the victim paid Rs 9,37,000, she grew suspicious and approached the Cyber Cell, which registered a complaint and began investigations. Based on the contents of the complaint, a case was registered under sections 417, 419, 420, 468, 471, R/w 34 IPC and Section 66 C and 66 D of IT Act. A team led by Inspector S V Harikrishna, SIs Vikram Reddy, Anil Kumar under the guidance of Inspector Mohammad Riyazuddin of Cyber Cell, raided the hide out of the accused and seized 8 laptops, 26 mobiles/ I-pads, 10 internet dongles, 35 SIM cards used for commission of offence.